If you have completed lessons One to Seven of this build-up, you can already play all the music in the Pyramids Concert Performance. All you need to do is add a chords-only Introduction from the Lesson Four Four-chord Version. 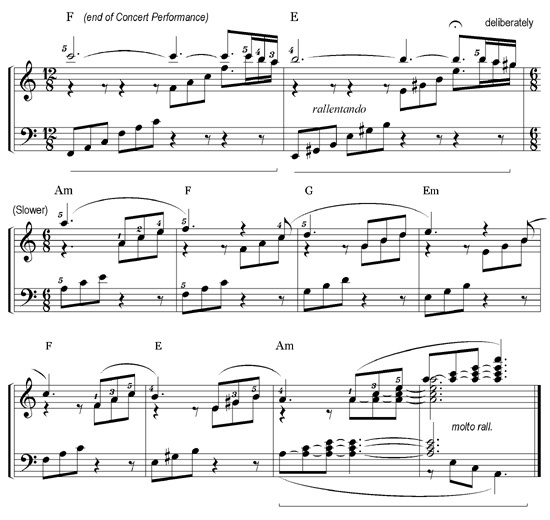 The Concert Performance consists of five 8-bar phrases in twelve-eight. Then you play the 32-bar A1-A1-B-A2 version from Lesson Seven. 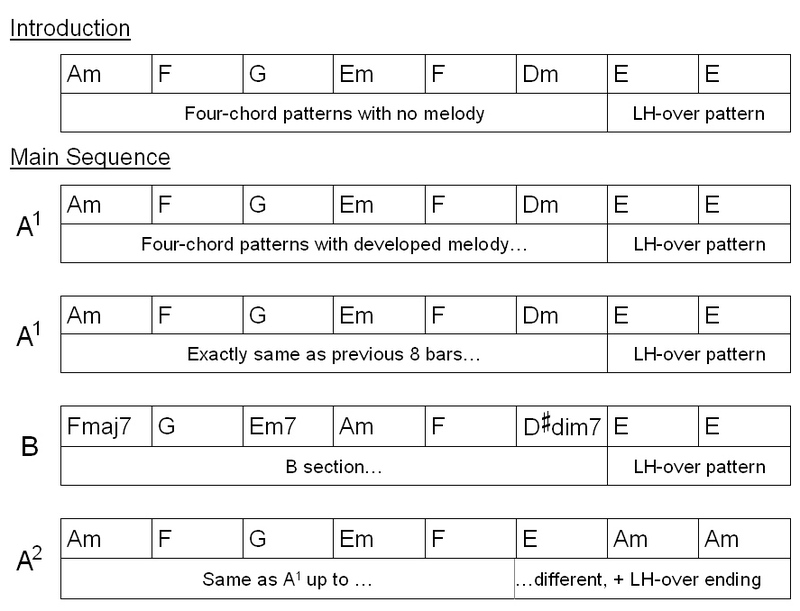 Here is a chord chart of the Concert Performance. If you can remember what you learned in lessons One to Seven in this series, you should be able to play the Pyramids Concert Performance from the chord chart right away. You will find the music for the Concert Performance on the following pages, but it is important to try to play the music from the chord chart or purely from memory. In the music, the repeat of the A1 strain is indicated by repeat marks: C B. 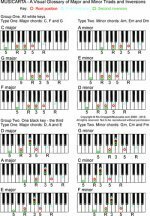 If you can read music well, study the music so that you can see how the chord chart represents it, and then use the chord chart on its own. The music does not have performance markings like tempo and ‘dynamics’ (loudness and softness indications). This is because the Musicarta method is designed to help you play more from your own knowledge and artistic impulse and less from written-out music. You must put those shadings in yourself. Of course, you will try to ‘bring out the melody’. It is also usual to try to make the B section different in some way, and slow down and fade away at the end. If you want a really musical performance, spend some time imagining what you yourself would like to hear. What orchestral instruments would you use if you could conduct an orchestra playing the Concert Performance? If the Pyramids music were a film soundtrack, what would be happening on screen? Imagine a concert pianist playing the Pyramids variations in the most outrageously ‘artistic’ manner possible – an aim for that performance. In music, segue [seg-wey] means ‘transition without a break into the next section of music or piece’ by making, for example, the last note A of one version the first note A of the next. Here’s a sketch of the segue into the reprise suggested above. Watch it on MisterMusicarta YouTube. This is the end of the build-up to the Concert Performance, but only the start of your creative exploration of just how much beautiful music you can make with the building blocks you already know. Have a quick look at the Supplementary Material section to see if there's anything there you can use to consolidate your performance, then go on to the Variations section and browse for an avenue you'd like to explore - the modules are not in any particular order of difficulty. Thanks for sticking with the program this far! I hope you feel your time has been well spent, and you're pleased with your Pyramids performance. Wishing you good luck and lots of enjoyment with the Variations.